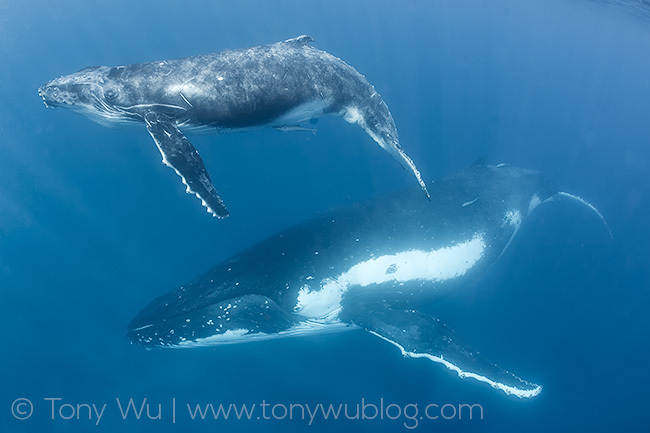 I am heading south again, for my 17th season with humpback whales in Tonga. Before I head out, I have one request to put out to the Internet. This female has been faithfully returning to Tonga for a long time. With the help of many other people, I have documented her with eight calves between 1998 and 2017, with photo and video IDs from both Vava'u and Ha'apai. The last time she definitely had a calf was in 2016. Assuming she is still healthy and active, chances are reasonably high that she already has or will return to Tonga this year with another calf. It is easy to identify her from the unique pattern on her side: long white stripe with a single dot. As pictured above, the dot is toward her front end on her left side. On her right side, it is more toward the rear. In any case, this patterning is not common, so she stands out. Click to download this PDF file, which presents the documentation I have for her eight calves (Big thanks! to everyone who has contributed sightings to date). And click here to read my previous post about her in 2016, with links to earlier posts included. Please help me keep an eye out for her. This glimpse into her life history is an excellent illustration of how and why humpback whales have been able to make a healthy recovery since we stopped killing them.